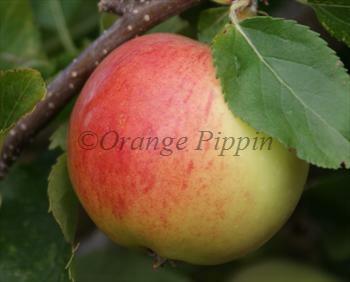 One of the most popular supermarket apple varieties, and a good mid-season variety for the garden in many areas. The sweet flavour of ripe Gala apples eaten straight from the tree is quite a surprise compared to supermarket examples. Gala is also a good variety for juicing, as you might expect the flavour is rich and sweet, useful for mixing with other sharper varieties. Please fill in the details below and we will let you know when Gala apple trees are back in stock. Flavour fades in storage but remains sweet? Tolerates a range of temperatures, including very warm climates? Gala is in flowering group 4. Gala is partially self-fertile, but fruiting will be improved if there is a compatible tree of a different variety nearby. Gala is widely grown on a commercial basis in South Africa, Chile, New Zealand, and France. One of its unique characteristics is that Gala will produce good-quality apples across an unusually wide range of climates from cool temperate to hot. Gala can be grown successfully in the south, central, and east of the UK, and crops well. However Gala is susceptible to fungal infections. If you have a dry climate this is not usually such a problem - and the flavour of home-grown ripe Gala apples is worth a bit of effort - but it is not a good choice for mild or wet climates. Most sports of Gala have some degree of self-fertility - but will set much better crops if there is a nearby pollination partner. Gala was developed by New Zealand apple enthusiast J.H. Kidd from one of his earlier successes, Kidd's Orange Red, which he crossed with Golden Delicious. Through this parentage Gala unites three of the world's most influential apple varieties, Cox's Orange Pippin, Delicious, and Golden Delicious. Gala is one of the most commercially important of all apple varieties, and as a result a large number of Gala "sports" exist. These are naturally occuring mutations which are mostly indistinguishable from the original in terms of flavour but may have a deeper coloration or more pronounced flush to the skin. Royal Gala is probably the best known. We occasionally offer some of these newer forms but most of our trees are the original Gala, which in our opinion has more attractive skin hues and better flavour when home-grown.